Early on this year, we went to Stephenson's Farm boot sale and I scored a genuine Louis Vuitton 'International' wallet for the princely sum of £1. The girl who was selling it said because it was worn and battered, she just wasn't interested in keeping it, despite it being the real deal (they are currently £270!). Obviously, I don't trifle in such whims, as long as something is serviceable, I'm happy and I knew if I left it behind someone else would soon have it. 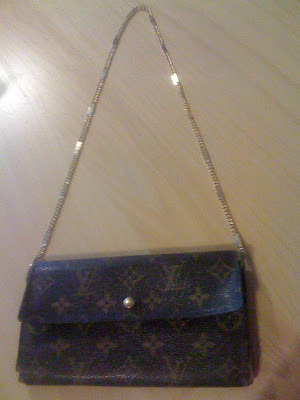 Well, its just been sitting with my other purses doing nothing, until I thought of some very easy customisation for it. I added my blingy chain to it and voila, a lovely little posh shoulder bag which will hold money, cards and a key. I used to have a couple of Louis Vuitton bags, but I sold them a couple of years ago on Ebay. I've just given away some bags I didn't want anymore, I've scaled right back on my bags and only kept the ones I really love. Now, I'm back on a bag buzz and can't stop browsing on Gucci and Louis Vuittons e-shopping sites!! This custom job will have to fulfill my designer itch for the moment!! Louis is timeless and you can never have too many. And it's so cool how creative you are. Hi lenya-thanks very much for your lovely comment!! Hi La Mimi-thanks a lot, yes what a price, huh!! great find! 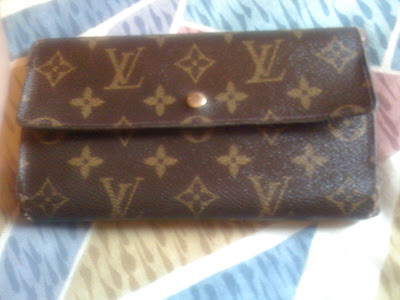 i'm looking to cop the lv monogrammed passport cover n i dnt wanna spend a lot..
Sharon, you are great at fixing things up! This looks fantastic, perfect for the holidays! So lucky!! I can't wait for the day to own my very own SPEEDY! Hi terencesambowrites-thanks a lot, good luck with the passport cover! Hi wendy-thanks so much my dear!! Hi Silje-thanks for your lovely comment, its something different! Hi yiqin-thanks my dear, I was looking at the speedys too, but out of my price range for the moment!! Do you remember my idea? HAHA! Variations one of my favourite chanel bag? Hmmmm? Hi janettaylor-thanks a lot my dear and yes, your chanel post was very inspiring!! Hi savvy-always lovely thanks my dear! Hi Deb-so pleased you are well my dear, thanks for the lovely comment too!! So clever - well done, Sharon Rose! Hi Sal-so lovely of you, thanks! darling what a great piece of customisation sweetheart!now its can double as a bag and purse. Maybe I'll do this to my wallet? I don't like LV logo, I don't know why, but actually the only thing by LV I'd buy if I had the money would be the limelight clutch, but for that money, it's a total bargain! And the price is nuts - is this your best find price-wise? Hi marian-thanks my dear, I may use it more now!! Hi dana-yes, I did have a pouchette too!! Hi S-so lovely of you, thanks my dear! Hi Fashion Dreamer-oh I hate it when that happens!! 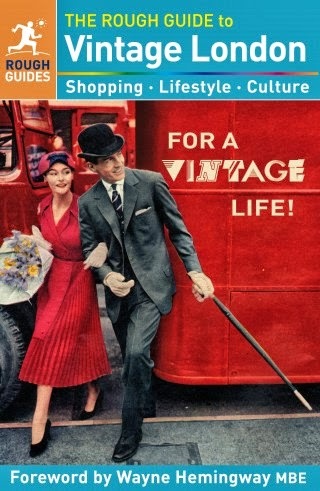 Hi Miss Thrifty-thanks for your lovely comment! Hi Atelier-oh yes, for that money I had to grab it!! 20p and it had £100 in a money bag hidden inside, LOL!! $1 is such a deal! Hi fabulously broke-yes, for that money, I'll use it once in a while, haha!! Sharon, nobody can reach out thrift bargains better than you, you got everybody beat in that game! If they trying to hide it, you will find it! LOL What a score! 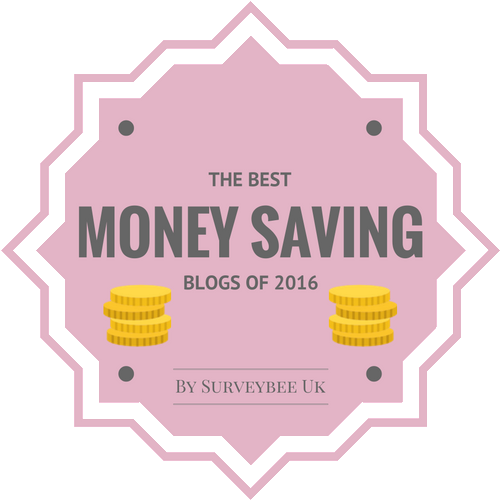 Hi budget chic-oh how lovely of you!! thanks a lot, it had to be bought for the price! !